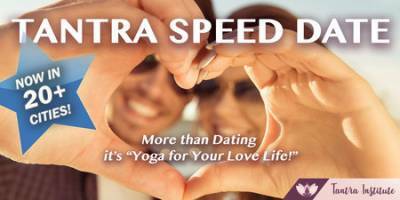 Tantra Speed Date - Oakland - Meet Singles! Now in 20+ cities, this Yoga-inspired workshop is more than dating, it's "Yoga for your Love Life!" Combination relationship skills class + speed date, you'll share a moment of guided connection with up to 24 dates in a traditional Puja circle. Exercises are fun, PG-rated (think light partner yoga, actor's improv, eye-gazing, dance), and are infused with positive relating skills. You'll walk away not only with matches, but with a refreshing perspective on what relationships can be! *Over 4,800 attendees have gone on 38,000+ dates in 20+ cities worldwide. 95% have matched with one or more dates. If you don't match, your next event is on us! Check out Dates for: Tantra Speed Date - Oakland - Meet Singles!